​Eda Glasbruk produced a number of variations on a theme that was based on a plain panelled pattern which they called Facett*. There were bowls, pitchers, vases, comports and much more besides: although all fell within the overall Facett pattern suite, it is interesting that Eda also gave them individual pattern names in the catalogue. Here we look specifically at Ostersund (Eda catalogue #2196), and Grada (Eda catalogue #2169). Ostersund is a candy jar (konfekturna in Swedish). It is a tall lidded container or urn, standing 10.5 inches high. The lid is elegantly domed upward and has a pagoda-like finial. this unusual and lovely item was illustrated in the Eda 1929 catalogue (as part of the Facett suite) and they named it Ostersund, after a well known Swedish city. 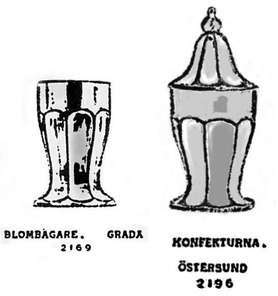 Grada is a flower vase (blombagare). It is 6 inches high, with a 4 inch top and a 4¼ inch base. In fact, in a very clever piece of marketing, it is the base of the Ostersund candy jar (without the lid) available separately in the catalogue as a vase. Ostersund and Grada are to date, only reported in blue Carnival. ​Also illustrated in the Facett range alongside the Grada vase were two other shapes of flower vase: Utsv (#2167) with a flared top, and a taller vase called Miriam (#2168), but so far neither of these vases have been reported in Carnival Glass. As explained above, Eda gave different pattern names to the various items in the Facett pattern suite. The pattern names given by Eda are Bristol, Chippendale, Grada, Ostersund, Miriam, Six Facett, Utsv and Zee One / Z1. The ones so far reported in Carnival are Bristol, Chippendale, Grada, Ostersund, Six Facett and Zee One / Z1, and the known Carnival colours in this range are marigold, blue and a rare smoke.